My search for information on Lahabrea and the Ascians had lead me to Little Ala Mhigo, and in need of aid to impress the Highlander residents I had traveled to Quarrymill in the Southern Shroud. I met with Meffrid, a Captain of the Ala Mhigan Resistance, whose reception of me was only slightly better than that of the Little Ala Mhigan locals. However, it had less to do with me and more to do with dying friend Gallien. The man had come down with an uncommon sickness, but not one that was incurable. Meffrid had been requesting aid from the resident of Quarrymill but met nothing but refusal. I decided to speak to Albreda why the man would not be helped and I quickly grew frustrated with her response. Albreda was one of the only Ala Mhigans who had been fully welcomed into the forest by the Elementals, the spirits of nature in the forest. These capricious sprites were very unwelcome to strangers in their woods, and were the reason why the first residents of the forest lived in an underground city long before Gridania finally came into existence. The fact that Gridania was even there was in part due to the Elementals finally conceding and the efforts of the Padjali, most notably the Elder Seedseer in our time. The Gridanians were constantly attempting to appease these Elementals to keep them from growing angry and revoking their welcome. Albreda, and the people of Quarrymill, refused to help Meffrid’s friend because the Elementals refused it. I sought out the ear of the resident Hearer, a woman named Charline. She was capable of communicating with the Elementals, much like the Echo allowed me to communicate with all manner of man and beast. I argued with her at length that a man’s life was at stake all because the Elementals refused he be cured. Charline was adamant and refused to go against the will of the Elementals. Completely frustrated, I returned to Meffrid and gave him the terrible news. He and I shared a few choice words concerning the situation and we began to brainstorm another course of action. Meffrid recalled an old Ala Mhigan remedy that required antelope horns and believed that though it was a long shot it was his best course of action. I set off into Silent Arbor, the woods immediately surrounding Quarrymill, and began hunting the native antelopes. I was in the process of tracking, just about to spring on the stag, when I was approached by two Twin Adder officers. I was politely informed that despite my position with the Grand Company, even I was not allowed to poach the animals of the forest. I kept my cool long enough to explain the situation and I was reminded that it was unwise to go against the will of the Elementals. The officers left me but I knew that they were out there watching me somewhere. I was well aware of the rules for poaching. No stag that hadn’t seen three summers could be killed. The officers stationed at Quarrymill simply wanted to prevent me from helping the Ala Mhigans. I returned to Meffrid empty handed and angry and told him what had happened in the forest. He was morose now, but admitted that even if I had collected the antelope horns he didn’t know how to make the medicine. He told me he had intended to send me to Buscarron to have him create the tincture. I didn’t know that the tavernkeep had dabbled in creating medicines, but considering his varied clientele I shouldn’t have been very surprised. I told Meffrid not to count his chocobo before they’ve hatched and rode back to Buscarron’s Druthers. The tavernkeep was surprised to see me back so soon and I filled him in on the events transpiring in Quarrymill. I was glad that Buscarron was just as appalled by the refusal to help the man and he informed me that he had some of the very same medicine that Meffrid had wanted to concoct. Apparently if I had even managed to get the antelope horns, the medicine would have taken days to brew and Gallien most likely didn’t have that much time. With the medicine in hand I made haste back to Quarrymill to hand it in to Meffrid. Meffrid was grateful for the medicine and rushed into the building where Gallien was bedridden. I settled down, expecting the man to be some time but he rushed right back out with the medicine still in his hand. When Meffrid told me that Gallien was gone, I feared that I was too late, but he showed me a note and I realized that Gallien had left Quarrymill. Not wanting to be a burden for his friends anymore, he had wandered off into the forest to die alone. Meffrid cursed his friend’s sudden stupidity and we set off into Silent Arbor to look for him. I found a fresh trail of disturbed foliage and followed it south east. The trail was leading dangerously close to a goblin encampment and I avoided it as best as I could while still trying to follow the path. I was eventually lead to an open cave mouth where a man lay resting against the cave wall and a goblin sporting a crude knife. The goblin raider clearly thought he had found easy prey and was about to finish him off. I intervened by means of a magic salvo and chased the goblin off. Meffrid arrived shortly after and he had a stirring reunion with his friend Gallien. Even though Gallien was sick, Meffrid refused to leave him behind. The bond between the Ala Mhigan refugees was strong, even if their homeland was gone. We helped Gallien back to Quarrymill and after administering the medicine Meffrid wrote a letter of introduction for me to give to Gundobald back in Little Ala Mhigo. I thanked Meffrid for his help and he assured me that it was the least he could do for all I had done for him. I set off back on the long trip to Little Ala Mhigo, arriving just before nightfall. My presence there was just as unwelcome as the first time until I delivered the letter of recommendation to Gundobald. He was enthused that I had done so much for the Ala Mhigan Resistance and welcomed me into their encampment. I spent the evening discussing our mutual problems. I was searching for the masked man, and Gundobald had heard rumblings that the younger members of the community were meeting with the masked man in secret. Apparently, the youths of Ala Mhigo had grown restless with their situation, cast out of their ancestral home and forced to live and work as refugees. I felt sympathy for the people of Little Ala Mhigo, but the youths were playing with fire. 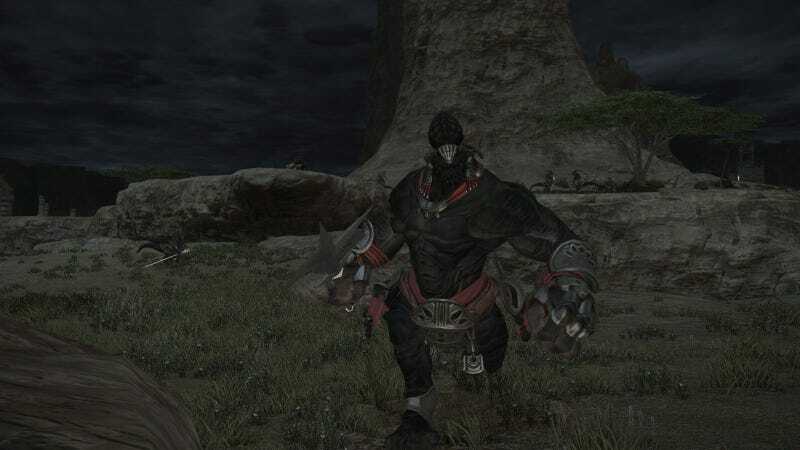 I knew that the masked man, Ascian or not, was bad news and Gundobald agreed. I decided to spend the rest of the evening speaking to some of the gang of young Ala Mhigans. I had only managed to talk to a couple before their ring leader, a young man named Wilred, told the others that I was in league with the elders. I spent the night in Little Ala Mhigo and woke to a surprise. One of the youths approached me and told me that Wilred had wanted to meet with me north of Little Ala Mhigo. It seemed that he had a change of heart and was willing to share information with me. I set off alone to the rendezvous point and met with the young Ala Mhigan. We had barely exchanged a few words before we were attacked. Three young men approached me swiftly, brandishing knives. They had intended to overwhelm me but I threw a cloud of miasma to slow them in their tracks and turned to grab Wilred to run. The man was already gone, having run clear past the group of attackers. Gripping my book tight, I realized I had managed to walk right into another trap. I lobbed blast after blast of magic at my would-be attackers and took them out with ease. It was clear the group were not experienced in combat and my superior firepower scared them off. I returned to Little Ala Mhigo and informed Gundobald what had happened. He was ready to turn on the youths but they couldn’t be found. After their failed attack they had not returned and were more than likely in hiding somewhere. Something was clearly going on in Little Ala Mhigo and the masked man was at the center of it all. Gundobald and I discussed our next plan of action. He had men out searching for the youths and without them we’d be unable to get any more information on the masked man. Noticing that I was an accomplished adventurer, Gundobald asked if I would be able to perform a favor for the community. A number of Ala Mhigans had defected and joined a group of bandits known as the Corpse Brigade and set up a camp to the north east. Despite once being members of Little Ala Mhigo, they had been performing raids on the underground city. Gundobald requested that I pay the encampment a visit and thin their ranks. I found the bandit stronghold easily enough and found two guards outside their gates, much like the Qiqirn bandit camp. I had a feeling that a couple coins wouldn’t be enough to draw them away and decided the straightforward approach would be best. I nonchalantly approached the gate with a Carbuncle familiar in tow and was accosted by the gate guards. I sent Carbuncle after the one and dispatched the other with ease. I then walked into the heart of the camp. I took out four more bandits before they grew hesitant to approach me. I delivered Little Ala Mhigo’s warning to them to leave the town alone and I left the encampment. I don’t enjoy hurting and killing people, but it’s one of those things all adventurers must face. Whether it’s Garlean soldiers or Ala Mhigan refugees who turned to a life of crime, if someone is doing something heinous an adventurer is often the one to perform the dirty work of removing that threat. I had been doing it long enough now that it was almost natural and it scared me. I lived in a world that was kill or be killed, and I had become coldly efficient. Perhaps that was the true reason I couldn’t pick up a bow again? I returned somberly to Little Ala Mhigo and reported to Gundobald that the deed was done. I told the man that if any more killing needed to be done he’d best find someone else. I spent another night in Little Ala Mhigo, keeping to myself and my thoughts. It was my skills as an adventurer that kept me alive through the Calamity and even before. Who was I to spurn those very skills that kept me breathing day by day? And what about all the good deeds I did, all the people I saved? Was there some karmic balance that I could try to live by? If I saved one life for every one I took, would that find me peace? My moral dilemma kept me up most of the night until a troubled sleep finally took me. When I woke in the morning I was prepared to join the search for the missing youths but I noticed that the atmosphere had changed overnight. The people of Little Ala Mhigo whispered quietly and watched me with hollow eyes. I found Gundobald and asked him what was going on. Earlier in the morning one of the missing youths had returned, a young girl by the name of Bertliana. She arrived in Little Ala Mhigo battered, bruised, and clearly through a lot worse. They had managed to learn from her between choked sobs that she had been taken in the night by the Corpse Brigade. That girl’s suffering was my fault and I was ready to march back to the bandit camp and level the place but Gundobald stopped me. He told me that if I was this worked up to think about what the rest of her friends would be willing to do. While I had been gone the night before Gundobald had had the youths’ belongings searched and found a map of Zanr’ak, the Amalj’aa stronghold to the southeast. The scribbled notes on the map had mentioned crystals and marked a position deep within the beastmen stronghold. My mind raced furiously trying to put together the pieces. I remembered the scroll I had found on the Ala Mhigan bandit that had attacked me outside of Highbridge. The mark of Rhalgr the Destroyer. They intended to summon one of the Twelve. After quickly explaining my theory to Gundobald we made haste toward the Amalj’aa stronghold in hopes of cutting off the wayward youths. We arrived just in time to find them facing down a group of beastmen. The young men and women weren’t soldiers though, there was no way they were going to get any further. They’d be slaughtered before they even made it into the gates. Gundobald rushed forward and engaged in combat with a massive Amalj’aa, barely knocking away a blow that would have surely killed Wilred. I joined the combat, throwing clouds of miasma and inflicting poisons on the beastmen warriors. We were too near to Zanr’ak though. Even as we fell back, more and more Amalj’aa came rushing from their camp to engage in combat with the would be intruders. As the would-be soldiers fell around me I couldn’t help but feel that this was all my fault. I had followed orders so blindly that the bandits decided retribution was in order, and now these people were dying in their attempt to exact their own revenge. Their blood was on my hands. My feet felt as if they weighed a hundred ponzes each and I could no longer move. I froze up completely, unable to even give aid to those that were still standing. Gundobald and Wilred stood back to back surrounded by a group of Amalj’aa, lashing out with their weapons to try and fend back the beastmen. The last remaining Ala Mhigans were being slaughtered as they attempted to retreat. A stray bow fell to my feet. I looked down at that bow for a short moment that seemed to stretch on forever. The curvature of the bow was off, the string fraying, the wood of some inferior material. My eyes found the discarded quiver and its spilled contents, the feathers crooked, the shafts warped and arrowheads dull. These youths, in reality young men and women who were no older than myself, had come to war with toys. For a moment I was back in Cartenau, the weapons of more skilled warriors at my feed. They were the only headstones those adventurers would ever receive. I gritted my teeth and fought back the awful memories. An Amalj’aa was bearing down on me, swinging its halberd right at my neck. I dropped down to my knees, picked up the bow and a stray arrow, and in a fluid movement knocked the bow and loosed the arrow up at the beastmen. The warped arrow flew true by some miracle and pierced the Amalj’aa through an eye. With no time to lose I gathered up the remaining arrows, slung the quiver over my shoulder and began sniping as I approached the encircled Ala Mhigans. I needed no last minute gift from Hydaelan to save these people, only the skills that I had forged in battle. Amalj’aa fell wherever I pointed the bow, my arrows finding their mark with deadly precision. Gundobald and Wilred escaped in the confusion and we began to run away with the Amalj’aa hot on our heels. I drew the last arrow from the quiver and focused my Aether into the bow. I jumped high, flipping in the air as I reached my leaps apex, and fired the last arrow, breaking the bow clean in half in the process. The arrow pierced an Amalj’aa in the center of the pack, and a rain of lances of Aetherial light poured down on the group. We barely escaped with our lives that day. Upon returning to Little Ala Mhigo I secluded myself. Gundobald approached me late in the evening, insisting that I eat. He had sent men out to retrieve the bodies of the fallen and they would be holding a service that night. He had learned from Wilred that, as I had suspected, the masked man had taught him and his friends how to summon Rhalgr. They intended to summon their God and use him to reclaim their lost ancestral home. I couldn’t prove that it was Lahabrea, but it was most definitely one of the the Ascians. I attended the service for the fallen youths that night. Their bodies were cremated in a massive bonfire that lit up the night. Before the service I had asked Gundobald a favor and he came through, bringing me the item I had requested. It was old and dusty with misuse, but after teasing the knobs I found that it still held a tune. With harp in hand, I sang for the dead through the night until my throat was raw and my fingers bled. Here we are, the last post for the week. I left it off on a sad note too. But you guys won't hate me for that, right? Right? Those Ascians sure are up to no good, aren't they? They're quite the rabble-rousers. Once again I had to pull a sidequest into the main storyline to make it flow correctly. The Corpse Brigade shows up out of nowhere, sparking the Ala Mhigan youths' plans into action. However, right before that is a sidequest to go and defeat some of the bandits. I wove it in and made the ending to this arc a little more sad than it was in game. There's really a pattern forming here. The main character in game does fail repeatedly at doing a lot of things right. The people lost to Ifrit's tempering being the first. But the game stays very lighthearted despite the terrible things that are going on. I hope that I'm adding a little humanity into this story. We'll be returning to the Black Shroud once more next week for a bit of a murder mystery. The story in XIV really does bounce a lot back and forth between Ul'Dah and Gridania regions, but after that we'll be hanging out in La Noscea a bit and running errands all over the world. Please look forward to it.